This variation improves both mobility and stability. THE CHALLENGE: The traditional plank builds isometric core strength and stability, but the core is meant to do more than hold a static position. Instead, research shows you should train for mobility in the upper portion and stability in the lower section. Adding the kettlebell element to the exercise does just that: It teaches the upper core to move, twist, and pull while keeping the lower core strong, sturdy, and stable. THE LEAD-UP: Place a kettlebell on the ground. Get in plank position with right hand beside the kettlebell, hands aligned under shoulders and feet shoulder-width apart. 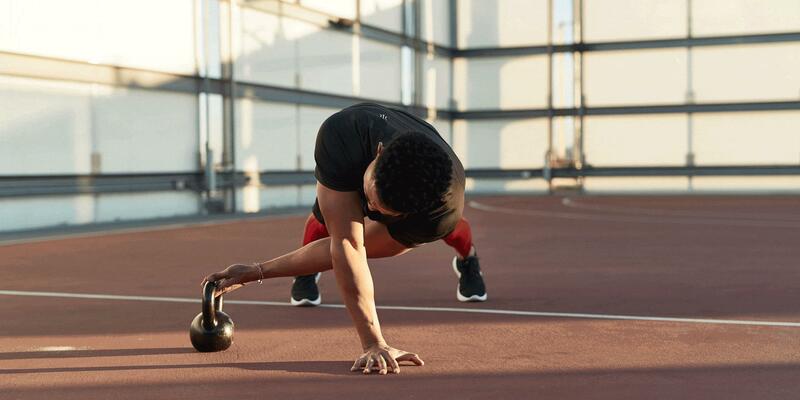 DO IT:Keeping body aligned from head to heels, reach left arm behind right arm, pick up the kettlebell with left hand, then extend left arm out to left side and place kettlebell on the ground. Return left hand to start position and repeat the entire sequence on the opposite side. Continue, alternating sides, for up to 2 minutes, or for as long as you can without sacrificing form. Rest for 30 seconds, then repeat once more.